Salesforce is a Customer Relationship Management (CRM) platform that can provide many benefits for your business, allowing you to track important data and effectively implement your growth strategies. It is used by both large and small businesses working in a vast number of industries. The Salesforce platform provides a wide array of services as a part of their enterprise cloud services, from analytics to collaboration tools, but to truly get the most out of it, you can integrate it with other cloud-based accounting systems like Sage Intacct, Microsoft Dynamics, NetSuite, Xero or Quickbooks. Integrating your accounting software with Salesforce will help to make sure your customer service, sales, and financial teams are in sync. This will minimize issues between these different aspects of your business. Many businesses make the mistake of separating their accounting, marketing, and customer service from each other with segmented software tools. Important information gets held up in one department when it could benefit another significantly and make a positive impact on the business as a whole. That information will probably eventually get where it should go, but it could be too late for it to make any difference. Not to mention, manual entry of data between systems often leads to errors and data discrepancies. Minimizing this “information bottleneck” will improve your business with speed and information accuracy. Salesforce integration with your accounting application will streamline this information flow. You’ll get a more cohesive view of what is actually going on in your business and make decisions based upon that clearer and more accurate view. You can use Salesforce to maximize efficiency, doing things such as automating invoice creation, syncing customer records and managing sales commissions. This is not to say that accounting software integration with Salesforce is always an easy thing to do. There are a number of common pitfalls that you need to avoid. Know why you are doing Salesforce integration and what you want to achieve. There are many different accounting tools you can integrate with Salesforce with their own capabilities and specialties. Integration is not a simple process and finding out that the tool you have selected does not do what you need it to is a waste of time and money. Know what you are looking to do with Salesforce and accounting application integration before you begin investing in it. Make sure you clean up your data before it is imported into Salesforce. Bad data will generate more bad data. This can be caused by as simple a problem as the labels and ID’s that you use to identify account names being different between Salesforce and your accounting application. Match them up before you sync up the two different platforms to prevent more confusion and generation of a large number of duplicates. Decide early on between custom objects and static schemas. You can only use custom objects and fields when your provider can pick up data dynamically. If there is support for these custom objects, you will be able to interact with them using their labels from Salesforce. Static schema, however, is predefined objects and fields. In order to modify them, you will need to go back into Salesforce. Using static schema will make it more difficult to create more complex workflows, but it may be a more financially fitting option for your business. Be careful about contact information. Accounting software tracks customer contact info by storing it in one record. Salesforce, however, may track several contacts under one customer profile. If you want to have the two platforms sharing information with each other, this can cause confusion. It’s important to pay attention to which contacts from Salesforce you are using for a customer profile. As with many other aspects of business, having a clear plan about your Salesforce integration is important. It will allow you to know what result you want out of the process, what resource you are allocating towards it, and how you can mitigate the issues described above or other potential pitfalls lurking. Microsoft Dynamics NAV provides a number of different financial services. It allows you to manage your accounting books and reports, automate your supply chain, and more. Microsoft Dynamics NAV allows you to connect financial data from accounting, sales, purchases, and inventory, as well as help to manage budgets and create sales forecasting. Multiple Microsoft Dynamics NAV databases can be integrated with one Salesforce instance. Syncing the two not only helps with keeping customer data synchronized but can also help both platforms maintain the most updated product and inventory information. Sage Intacct automates a number of vital processes and offers business owners a more effective and comprehensive view of performance. This accounting application’s stated goal is to reduce users’ reliance on spreadsheets. It covers all your core financial needs and is very highly rated among accounting applications. By integrating Sage Intacct with Salesforce, you’ll gain a very thorough and transparent view of your customers and customer interactions. 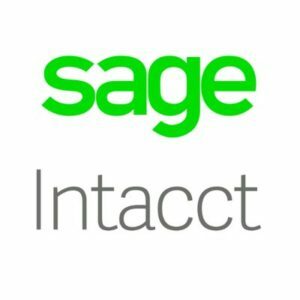 Sage Intacct has been designed with Salesforce and business application integration in mind, making it one of the smarter accounting applications to integrate. You can check and modify data housed in Sage Intacct while using Salesforce. It is an extremely effective method of streamlining your workflows. Sage Business Cloud Financials is accounting software developed by the same company as Sage Inacct. It is focused on providing business and industry live updates on any device. It is a great solution for a business team that is frequently on the move and needs to be able to make decisions no matter where they are. Sage Live is built on the Salesforce App Cloud, meaning it is already integrated with Salesforce. You will get the most out of Sage when using Salesforce in conjunction. NetSuite is a cloud-based business ERP application that offers flexible accounting and financial management, enterprise-level business information management and real-time analytics of financial performance. Transactions can be tracked on every level. You can use NetSuite’s accounting application to manage your billing, revenue recognition, financial planning, financial reports, and much more. It’s a very flexible and comprehensive accounting and ERP suite. Integrating your NetSuite ERP application with Salesforce will provide the CRM platform with up-to-date info on transactions, accounts, and financial reports as well as providing NetSuite with up to date information on sales pipeline metrics. The end result will be an enhanced management and business technology experience with concrete insight into business-critical information. NetSuite is an ideal platform for integration with Salesforce and it can be done with pre-built connectors. QuickBooks Online is one of the most commonly used and highest reviewed accounting software suites for SMB’s. This can be seen in numerous software review sites across the web. You can easily use it to manage bills, track travel miles, create financial reports, pay your employees, even among contractors, and more. Some users consider the software’s frequent updates to be more of a bug than a feature since sometimes it forces users to re-learn how to do basic tasks, but it is a sign of just how much effort the company puts into keeping the software secure and up-to-date. Intuit, the company behind Quickbooks, has seen the value of integrating QBO with Salesforce and has done what they can to make integrating the two easier for their customers. QBO is very good at what it does with accounting, but does not provide the same support as Salesforce does for customer tracking. Integrating the data maintained by QBO with Salesforce’s CRM capability enables you to make more accurate decisions about sales opportunities and the direction you want to grow your business. Xero, similar to QBO, provides online accounting services for small and medium businesses, including managing customer payments, inventory, payroll, paying bills, and tracking bank reconciliation. Xero is designed to make accounting faster and easier, which it does very well. It can be used on any device through its mobile app and reports can be customized to suit your needs quite easily. The support is excellent. Integrating Xero with Salesforce will make your business move much faster by taking advantage of Salesforce’s top-tier CRM platform and Xero’s excellent accounting capabilities. You and your team can receive accounting information on Salesforce from Xero, while transactions completed using Salesforce will be transferred to Xero and will be reflected right away on your accounting reports. Integrating accounting applications with Salesforce improves the quality of the information accessible to your organization. It allows you to minimize “information bottlenecks” and ensure that the decision makers in your organization have a complete picture of events when they need it. There are accounting applications designed to manage a number of specialized functions, many of which can be integrated with Salesforce with the right knowledge and experience. The end result is a more efficient flow of information across business silo’s and ultimately an improved bottom line. At Curotec, we have extensive experience integrating business applications to improve the overall effectiveness of the software. We help our clients extend Salesforce into mobile and web applications for both customers and employees. Contact us today to see how we can help you integrate your accounting software with Salesforce or another CRM. Our experts are ready to help customize a solution with a positive impact on your company.